Easy to use IFC data and workflow. Building information models contain a large amount of information that is of great value also to other actors in a building project, but there are currently several technical and process-related problems in the way. 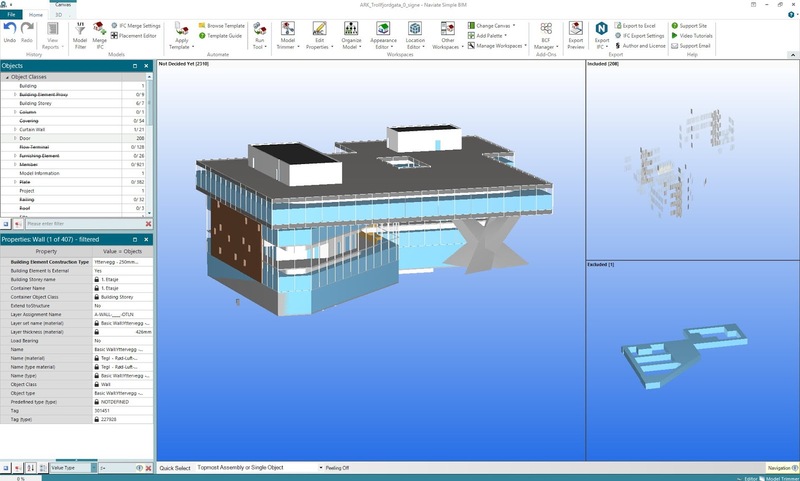 With Naviate Simple BIM, you can easily create models that only contain the information needed for a specific task. Add data from external sources, such as analysis results or detailed component information, to IFC models. With Naviate Simple BIM you have full control over your IFC data. Validate IFC files against the requirements of your application and your project. Building information models contain a large amount of information that is of great value also to other actors in a building project, but there are currently several technical and process-related problems in the way. With Naviate Simple BIM, you can change this. Now, you can easily create models that only contain the information needed for a specific task. One requirement of data exchange within the building industry is that the information being managed is reliable and quality assured. Naviate Simple BIM is a BIM editor that gives you the simple but powerful tools you need to manage BIM for professional quality data exchange. Unnecessary information causes unnecessary problems. With Naviate Simple BIM, you trim the model by removing objects and properties that are not necessary or reliable. This not only reduces the size of the IFC model (by up to 90%) but also makes the IFC model more reliable. Furthermore you always know exactly what is in the models you manage, as Naviate Simple BIM gives you a preview of the objects and properties to be exported. In a BIM workflow that exchanges IFC-related information, you must use grammar that is understood by the receiving program. BIM grammar differs for different applications, for example quantity calculations, interference control or energy analysis. The minimum requirement is that the correct setup and properties for every object type are included. Naviate Simple BIM has the tools to ensure that the grammar is correct, and there are templates for exporting to other systems such as, for example, energy analysis software. When you have finished editing your IFC file, you can save the edited model from Naviate Simple BIM to a new, enhanced IFC file. This means that you only exchange data that are relevant and approved in the exported model. In most cases, the size of the new IFC file is only a fraction of that of the original file and the file is imported much faster and more cleanly in the receiving program. The filtering and editing provide great control over geometry and IFC workflow. Storing templates for recurring tasks is another time-saving feature. Naviate Electrical is a solution for Revit. Nordic standards are built in and everything is preconfigured to enhance your BIM workflow. Naviate HVAC & Plumbing is a solution for HVAC and Plumbing Engineers who wants to take full advantage of BIM. 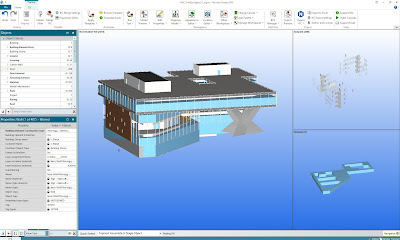 Naviate Simple BIM is brought to you by Symetri. It's priced beginning at €1,420.00/year.